Molly won the heart of Jason Mesnick on “The Bachelor: Season 13.” Her quick witted sense of humor and amazing style captured America’s attention. She was an early favorite and continued in that role throughout the season. I loved Molly’s hometown date. She and Jason looked adorable in their preppy outfits. Maryann Malaney had them wear hats and Jason draw a picture of Molly. It was such a fun date and it was clear how in love they were. Jason and Molly at her hometown date. When it was down to the final two, Molly had the chance to meet Ty. They had a wonderful time at the beach and Ty was taken by Molly. In one of the most shocking finales in Bachelor history, Jason did not choose her. Jason regretted his decision and they were reunited at the “After The Final Rose.” The pure joy on both of their faces was enough to warm the hearts of fans everywhere. Jason and Molly reunited at the "After The Final Rose." It may have been in a roundabout way, but they ended up together. An engagement and marriage happened. Their wedding was televised and if anyone doubted them for a moment, that went away. Their love faced tabloids, hardships and they are as happy as ever. Two years later, they proved they are the real deal. They may be one of the two lasting couples, but their love it truly one of a kind. Molly started out the journey looking for love. She found love, a husband and is an amazing step-mom to Ty. I’m so thrilled Molly did an interview with me. Jason’s season was one of the best and Molly is one of my favorite contestants from the series. 1. You and Jason just had your two year anniversary. Did you two do anything exciting to celebrate? Can you believe it has been 2 years already! We celebrated with a mini “stay-cation” at one of our favorite hotels in Kirkland . It was just a great excuse to get out of the house and relax. We each got a massage, went out for a nice dinner, and just enjoyed each other’s undivided attention! 2. How is married life going? Married life is great! I fall in love with Jason more and more everyday. Honestly! That’s not to say we don’t get into little tiffs about emptying the dishwasher ;) but we’re at a really great place in life where we have figured out to really work together in this thing called life! Molly and Jason at their wedding. 3. You have a new website, www.mollymesnick.com. I love the site. What inspired you to start your own website? About a year ago, I started blogger for a few websites both related to The Bachelor and fashion. I had a great time doing it, but wanted a bit more control over what I wrote about and when. That being said, it made total sense to start my own website where I could highlight everything that I love from fashion to beauty and even crafting and cooking. I am having an absolute blast running the website and there has been a great response from my readers. 4. What are your main goals for the website? I have been blessed with this really great platform since being on The Bachelor. I’ve been given a louder voice and some notoriety. At the same time, I try to remain very grounded and approachable. I still feel like a regular old gal, so why should I act any different. With this website, I hope to bring that “attainability” to my readers through promoting Looks for Less, DIY craft ideas, easy recipes and beauty secrets. I want it to be a safe and comfortable place for people to read about things that they can ACTUALLY get and do themselves. 5. Bachelor contestants Trista Sutter, Natalie Getz and Nikki Kaapke contribute to your website. Do you remain close with any other Bachelor contestants? I am close with a lot of the ladies from the Bachelor. I would say I’m closest with Ali, Jillian, and Trista. Nikki and Natalie are also really great friends from my own season. We’ve all gone through this crazy experience on the show and no one else in our lives can relate to it, so we immediately form a bond. I’m going to have life lasting friendships with all of these ladies. Trista Sutter, Molly Mesnick and Ali Fedotowsky. 6. Have you been watching Bachelor 16? Holy Wow…YES! This is 100% the Most Dramatic Season in Bachelor History! I just feel like the format of the show has changed so much since our season. It’s definitely more about the drama than finding a love story…but that certainly makes for great entertainment! I just can’t recall ANY of the girls from my season acting the way these girls did. Our time in the house was all about fun, sun, and occasionally going on a fun date with the Bachelor. I would not have been able to handle being in the house this season. No way! Lindzi Cox (Season 16 runner-up) with Molly. 7. Your have a great sense of style. Who would you consider the best dressed of Bachelor 16? I think Casey S had the best style and I wish we would have seen more!!! 8. I see you are a Stella & Dot fan. I am an independent stylist and adore the jewelry. What is your favorite Stella & Dot piece at the moment? I Looove Stella & Dot! They have the best statement pieces, and you can catch me in one of their delicate necklaces on a daily basis! My favorite piece from their new spring line is the Zahara Bib necklace. It is the perfect piece for spring! Molly wearing Stella & Dot. 9. Where are your favorite places to shop? I do nearly 99% of my shopping online. I just can’t stand going to the mall and dealing with crowds, parking lot, etc. That being said, at the moment, I’m constantly shopping on Urban Outfitters, Asos, and Shopbop. I also love finding small online boutique like AntoniaBee.com. 10. You have worked in fashion, went on the Bachelor and now have a great website. Where would you like to see yourself five years from now? Great question! In five years, I’d like to think that our little family of three will have expanded a bit. That will likely be the biggest change from now to then, but I’m also the type of person that has to keep busy, so I will no doubt be working in one format or another, whether that is concentrating on my website or through another opportunity. Who knows what the future holds! Jason and Molly at a race. I can't wait to see what is in store for Molly, Jason and Ty. 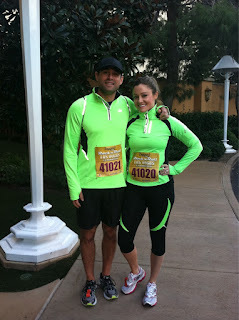 Make sure you check out Molly's fabulous website, www.mollymesnick.com. 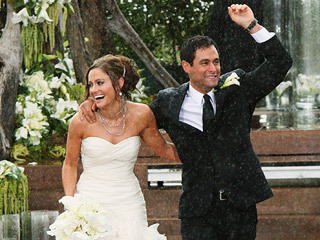 You can follow her on Twitter, @MollyMesnick. Like Molly's Facebook here. I hope you all enjoyed the interview. I'm so glad to catch up with one of my favorite contestants. I am hoping the Mesnicks, Sutters, and other couples/singles become contestants on "The Bachelor Pad." I have another interview for you next week. Happy Friday! I have a serious friend crush on Molly! I think girls from the Mitten are just kindred, man.